SCD (screening compound database) is added to ACD on the All New DiscoveryGate. AKos Samples is now updated in other public database. AKos Samples data source is updated in CWM Global Search. This works also in the free version. Accelrys Draw 4.0 is released - get a free version for academic and non-commercial use. Our mailing list is generated mainly from business correspondence. We use automatic procedures to do this. Please send an email to subscribe@akosgmbh.de if you want to receive future newsletter, or send an email to unsubscribe@akosgmbh.de if you want to be removed from the mailing list. Please forward this to a friend, who might be interested. AKos GmbH added the products of biochemfusion to its portfolio. 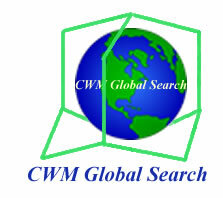 CWM Global Search allows searching the Internet by structure, synonym and CAS Registry Number. In a Quick Search, we return structure, names and CAS Registry Numbers* within seconds. The Global Search allows a comprehensive search and the resulting links are organized by topics. A search by name can automatically invoke another search by structure and/or CAS Registry Number, or any combination of these. 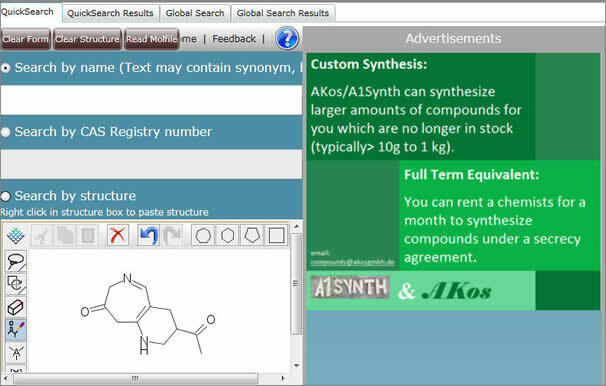 CWM Global Search presently searches 44 free chemical and pharma relevant databases -- containing more than 100 million pages which associate chemical structures with data. All you have to do is to open the URL http://cwmglobalsearch.com/gsweb in your Internet Explorer or Firefox on Windows, or Safari on Macintosh. At the first time you will be asked to install the Microsoft Silverlight Plug-In, provided it is not already installed. We recommend to start by reading the installation notes at cwmglobalsearch.com/installation. 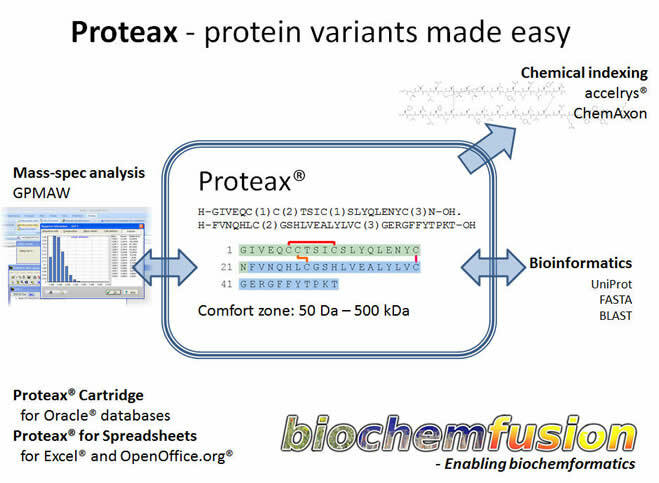 A free version is available that is restricted to searches at Google, PubChem, ChemSpider and AKosSamples. We sincerely are interested in your feed-back. Please use the feedback button in the application. Place your advertisement in CWM Global Search. This will help us to keep the price of the application low, maybe even free one day. You want to know something about "mephedrone". This is a designer drug. You will find an article: "
... and more articles in Medline and citation in Google Scholar. Make informed compound purchasing decisions and cut costs with structure-searchable databases of supplier compound information that include supplier, location, package, purity, and cost information. 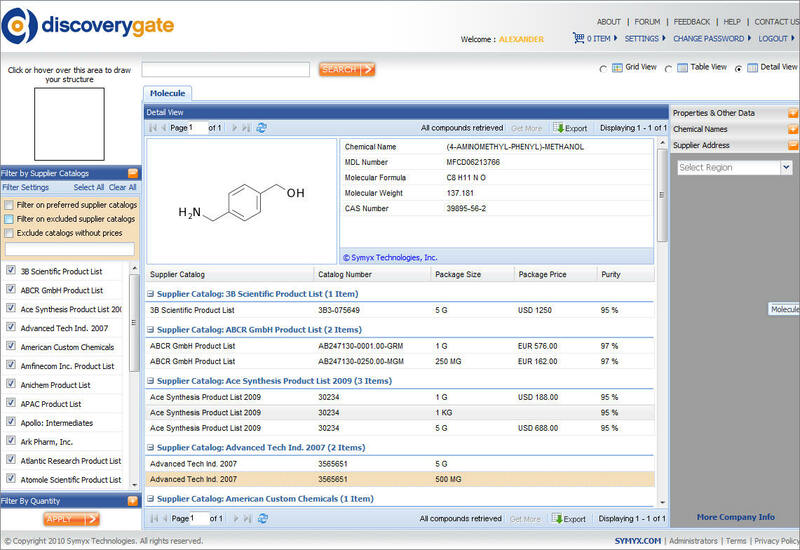 The SCD (screening compound database) data are now added to the web application of the All New DiscoveryGate. Go to www.discoverygate.com/dg3 and the ACD/SCD application opens. If you have no login information, you still can use it, only, you will not see prices and the shopping cart will not work. You can ask for a free-of-charge evaluation. CWM Lead Finder is an extremely powerful tool to quickly find lead compounds in a large set of compounds with unknown biological effects. Results of comparing PASS with CWM Lead Finder. Compounds with the activity "antiinflammatory" in CMC, the so-called "Knowns". PASS gives the best ratio of actives versus false-positives at Pa > 0.4 - We have no idea if this is general, but we observed it several times. CWM LF provides very potential leads in the clusters with the greatest ratio (high accuracy) - this is why CWM LF was developed. Pa > 0.9 provides also high accuracy, but in CWM LF the user has additional clusters if the structure similarity compared to known compounds is too large. CWM LF provides an easy user interface to compare known and unknown. CWM LF performs better when the profile is made by ca. 20 activities, but basically it is not very sensitive to this. CWM LF has further selection methods for finding the best lead using structure similarly clustering, toxicity warning, and sorting by PASS numbers (the larger the number the less specific is the compound). The approach of using biological profiles instead of single activities has been proven valuable. AKos GmbH is a broker for selling screening compounds. You can search the AKos Samples database by structure using CWM Global Search. Please visit our download page. All SDFiles were normalized, and have a consistent AKos Number. Please replace any previous files that you had from AKos Samples. We also offer as service to develop syntheses for you. We have several labs that work extremely well and are suited for such tasks. 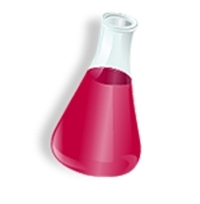 You can hire a full term equivalent of a chemist to synthesize compounds under a secrecy agreement. Please use the keyword "Beilstein" in the reference line to avoid the SPAM filters. GxP Manager is a program that helps you to collect all the user requirements for an IT project. The software helps you, and forces you to translate these requirements to functional specification and technical specifications that are in accord to regulations. You can validate modules, as they become available. GxP Manager helps you to break a large project into manageable pieces, and provides you an overview at any time. 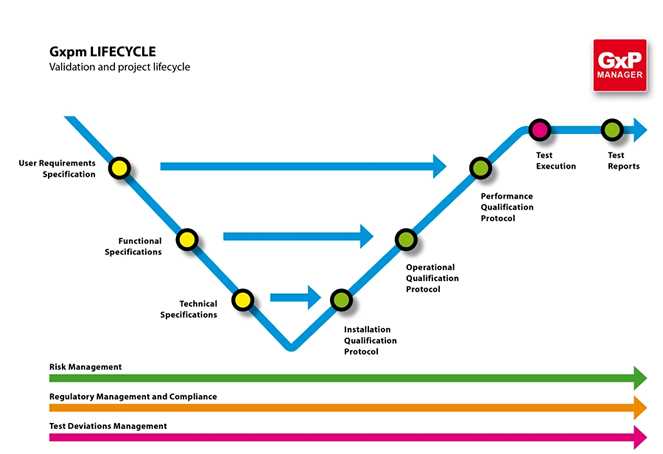 When analyzing the tasks in a validation cycle, one must recognize that the time taken by valued technicians to create paperwork largely exceeds the time to execute the tests. Paperwork may have to circulate multiple times before being approved. GxP Manager avoids all this paperwork during the process, only the final results are printed for documentation purposes. a software for IT projects! * CAS Registry Number® and Synonym CAS Registry Number, SciFinder are registered trademarks of the American Chemical Society (ACS). All Rights Reserved. JDraw is a Java applet structure editor from Accelrys, Inc.